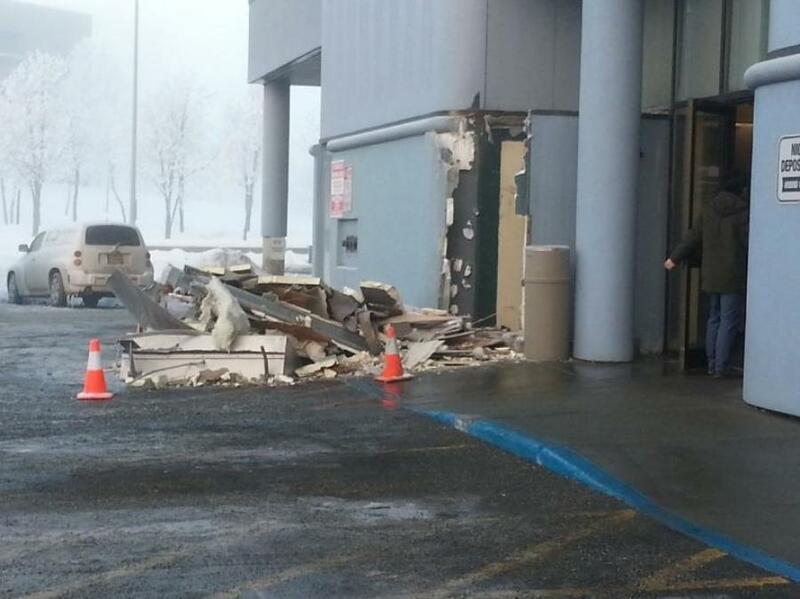 A midtown Anchorage bank had a rather rude awakening after an early morning heist left a gaping hole in the wall. The ATM usually kept inside was nowhere to be seen. The first call to police came from the Anchorage Fire Department, stating that a fire alarm at Denali Federal Credit Union had been tripped at around 2:30 a.m. When investigators arrived, they found a huge hole in the wall. During the course of the investigation, surveillance evidence showed that the thieves used a construction vehicle to bust through the wall to a separate room that contained the ATM, pull it out, and load it into the vehicle. “They tore up the room that it was built in and took the ATM,” said Keith Fernandez, a vice president at the bank. He said it's definitely not a common occurrence. Fernandez says the investigation is now being handled by the FBI, as the agency is automatically called in to matters like these where federal financial institutions are compromised. Evidence at the scene showed an elaborate extraction of the ATM, one which Fernandez called “bold.” He believes that despite the bank's location at a highly visible intersection, the robbery was carried out at a decisive time, around 2 a.m. when traffic is lower. In addition to the surveillance and other clues left for investigators, Fernandez says the thieves might have another problem on their hands. He says breaking into the ATM is easier said than done. Anchorage Police and the FBI have confirmed they are pursuing all leads at this time, so time for the thieves to open the ATM and the safe inside may be limited. For more information, visit http://url.ie/11ofc. ARRA Funded Projects in the Works in Northwest Ga.